An officer of one-star rank is a senior commander in many of the armed services holding a rank described by the NATO code of OF-6. The term is also used by some armed forces which are not NATO members. Typically, one-star officers hold the rank of commodore, flotilla admiral, brigadier general, brigadier, or in the case of those air forces with a separate rank structure, air commodore. 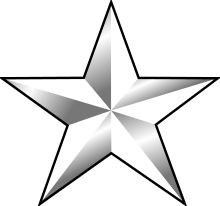 Officers of one-star rank are either the most junior of the flag, general and air officer ranks, or are not considered to hold the distinction at all. Specifically, in many navies, one-star officers are not considered to be flag officers, although this is not always the case. The army and air force rank of brigadier general is, by definition, a general officer rank. However, the equivalent rank of brigadier is usually not designated as a general officer. The air force rank of air commodore is always considered to be an air-officer rank. The maple leaf appears with St. Edward's crown and crossed sabre and baton. Before unification in 1968, the rank of air commodore was the one-star rank equivalent for the Royal Canadian Air Force, and brigadier for the Canadian Army. This car has one star (on the blue box), indicating that it belongs to a one-star ranking Indian police officer. Pakistani air commodore 's rank insignia. In the modern naval services of Belgium, Denmark, Finland and Sweden, the one-star rank is flotilla admiral.